I have been growing green beans in my garden for a few years now. The first time I grew them I grew the bush variety. We got a TON and they were super delicious. But they took up a lot of space in my garden, and I felt like there were a ton of bugs in the plants…….grasshoppers. Ew. I dislike grasshoppers far more than any other insect. So much so that if I see one while I am picking my garden, then I am done picking and run away screaming like a little girl. My neighbors probably think something crazy is going on in my back yard but really its just grasshoppers. Anyway, the last few years I have been growing the pole variety of beans. We have a trellis that we grow them on and they just climb right up. They are easier to pick because you aren’t always bending over. We love green beans in our family. We love them steamed, roasted, pickled, and canned. 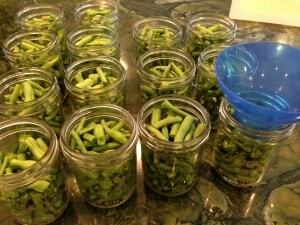 Last year I mostly froze all of my green beans and so I wanted to preserve them with a different method this year. Frozen and canned are very different, but I think it is good to have a variety to offer to your children. They may not like them steamed, but like them canned. Who knows with kids sometimes, right?? You can always involve your kids in the process which is so great. If they feel ownership with their food, they are much more likely to eat it. Plus you are creating memories!! 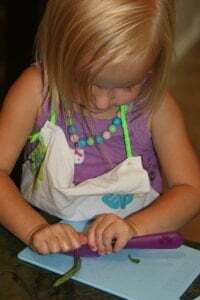 My girls helped with cutting the green beans. This is the first step. 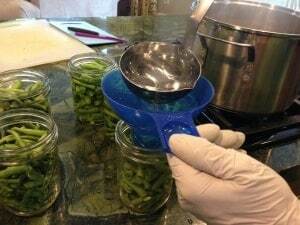 You will want to rinse your beans thoroughly, snap or cut off the ends, and then cut them into uniform size pieces. 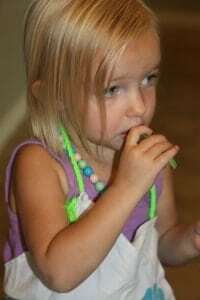 And of course they end up eating whatever you are canning along the way. 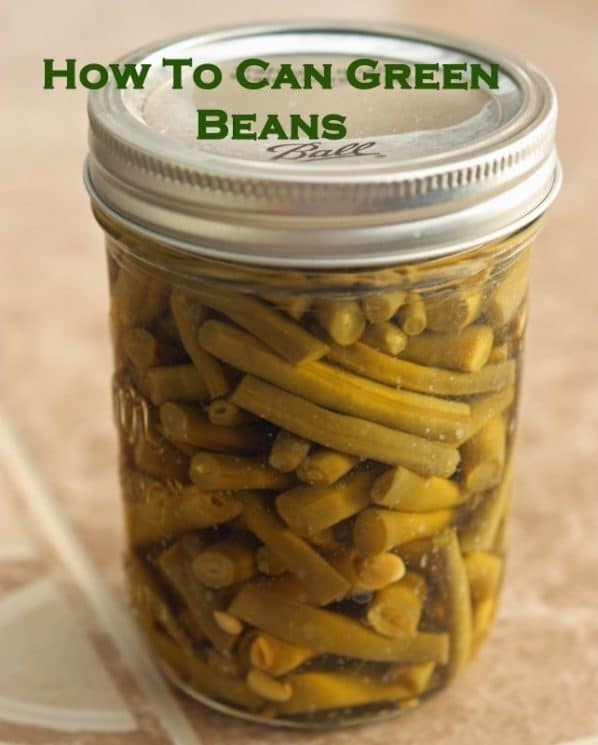 In order to can green beans, you will need a pressure canner. The acidity of green beans isn’t not high enough to just water bath them. 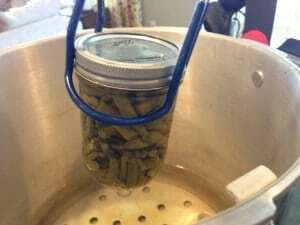 Some day I intend do you an in-depth post on pressure canning and water bath canning, but for now your best resource would be to visit this page for pressure canning. 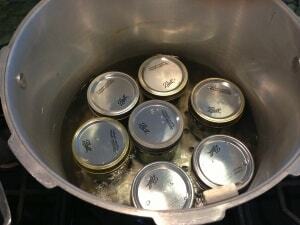 I have a Presto pressure canner – the 23 quart size so that I can double stack my jars. I LOVE it. Very easy to use and has held up amazingly well. Place your beans in your jars, filling them tightly with the beans. I like to use wide mouth pints for beans. You will want to leave 1″ headspace at the top. You can add 1/2 tsp of canning salt to each jar, but it is not necessary. I never add salt to my produce when I’m canning because I am an advocate of using less salt in your diet. It is totally up to you and your tastes though. This is called a ‘raw pack’ method because you are putting the beans in raw and then will cover with water. Next you will fill the jars with boiling water leaving 1 inch headspace. Next you will fill your pressure canner with water so that there is about 2-3 inches in it. Also, make sure you have the rack at the bottom. Put this on your burner and turn it on high to get it boiling. 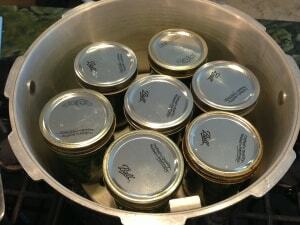 Once your jars are filled, place the lids (after you have boiled for 30 seconds or so) and the rings on the jars. Place them in your pressure canner. My canner can fit 14 pints because I can stack them. If you are going to do this, make sure to put another rack in between the layers. Place the lid on your canner. Turn the heat setting to its highest position. Heat until the water boils and steam flows freely in a funnel-shape from the open vent pipe. 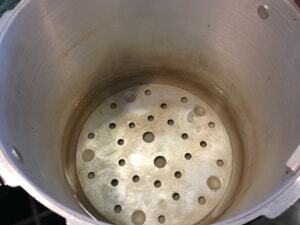 While maintaining the high heat setting, let the steam flow continuously for 10 minutes. Next you will place the weighted gage on your vent pipe and your canner will start to pressurize over the next 5-10 minutes. For my altitude I pressure my beans at 13 pounds. The following table will help you determine the time and pressure you need for your specific altitude. You will start timing once the gage has reached the desired pressure. I pressured my beans at 13 pounds for 20 minutes. Recommended process time for Snap and Italian Beans in a dial-gauge pressure canner. 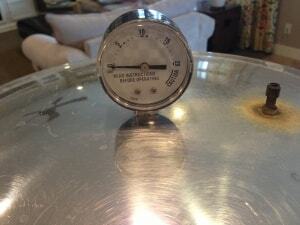 While the canner is cooling, it is also de-pressurizing. Do not force cool the canner. Forced cooling may result in food spoilage. Cooling the canner with cold running water or opening the vent pipe before the canner is fully depressurized are types of forced cooling. They will also cause loss of liquid from jars and seal failures. Forced cooling may also warp the canner lid. Even after a dial gauge canner has cooled until the dial reads zero pounds pressure, be cautious in removing the weight from the vent pipe. Tilt the weight slightly to make sure no steam escapes before pulling it all the way off. Newer canners will also have a cover lock in the lid or handle that must release after cooling before the lids are twisted off. Do not force the lid open if the cover locks are not released. Manufacturers will provide more detailed instructions for particular models. Once your canner has completely de-pressurized, carefully remove the canner lid and then with a lid lifter remove your jars. 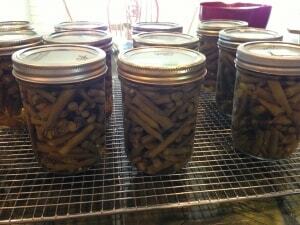 Place them on a cooling rack and let the jars sit undisturbed while they cool, from 12 to 24 hours. Do not tighten ring bands on the lids or push down on the center of the flat metal lid until the jar is completely cooled. Label jars and store in a cool, dry place out of direct light. That is it folks! And then you will have yourself some home grown, delicious canned green beans for this Winter! I just love this. Seriously canning makes me so happy. Very interesting and Valuable post thanks for sharing !